Unionized teachers in British Columbia, Canada, recently won a victory against school officials when they got an agreement to allow teachers to distribute union pamphlets opposing standardized tests to their students. The teachers are also calling for a two-year moratorium on standardized tests in the entire province. 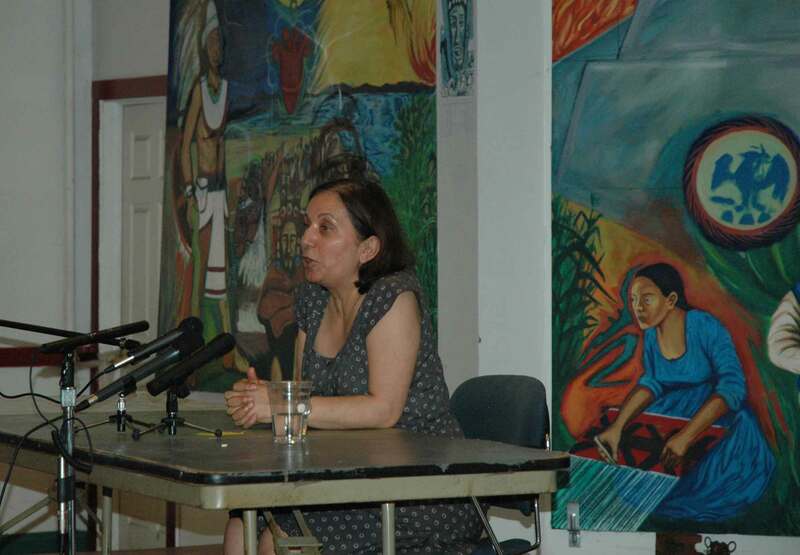 Above, former British Columbia Federation of Teachers president Jinny Sims speaks to a group organized by CORE and Teachers for Social Justice at Casa Aztlan in Chicago on June 7, 2008. The Jinny Sims visit helped catalyze CORE, which was organizing itself at the time. Sims led the October 2005 strike that closed the schools of the entire Canadian province of British Columbia for nearly a month. The event was ignored in the media in the USA. Substance photo by George N. Schmidt.According to a recent (December 22, 2009) report in the Vancouver Sun, teachers in British Columbia are calling for a two-year moratorium on standardized testing in the entire province and recently won the right to send home with students three union-produced pamphlets making the case against the use of standardized tests. The British Columbia teachers have led Canada in opposing the abuses of standardized testing and have also been among the most militant in North America since the beginning of the century. In October 2005, they led a lengthy strike against neo-liberal attacks on public education in the province. The strike was reported exclusively in Chicago in Substance. [See http://www.substancenews.com/content/view/296/81/]. More recently, former B.C. teachers union president Jinny Sims spoke in Chicago during a series of meetings that helped launch CORE (Chicago's Caucus Of Rank and file Educators). [see ]. (FSA) and the Grade 10, 11, and 12 provincial examinations. The BCTF further calls for government to establish a Testing and Assessment Task Force to explore the issues and information about assessment and to make recommendations to government before the conclusion of the moratorium. This task force should have on it a majority of teachers selected by the BCTF on a representative basis. This is not a call for an end to all testing. Classroom teachers will continue to use tests for diagnostic or instructional purposes, for formative as well as summative evaluation. for collaboration and engagement over the disrespectful climate of control and confrontation. Why a Testing and Assessment Task Force? voices on these issues, as well. What are the issues that should be examined by the task force? standard curriculum. This competition then sacrifices curriculum breadth and depth, academic rigour, and the ability of the teacher to design instruction to meet individual students’ needs. All the partners in education in BC — teachers, administrators, parents, and ministers of education — have condemned the way in which these results are used. The current structure of the Foundations Skills Assessment ensures that the Fraser Institute will be able to continue to use these results inappropriately. That can be stopped by moving to another structure for assessment — a random sample. A random-sample application can be designed to ensure that the objectives of the ministry are met. Such a sample would have to be able to assess the effectiveness of the curriculum and to identify subgroups, such as students with special needs or Aboriginal students, and determine whether or not the system is serving these students appropriately. An assessment that provides information to a teacher about what an individual student needs in order to develop understanding of a subject or topic is different from an assessment of how well an education system is performing according to general goals for education. The researchers who make up the American Education Research Association point out that “in using the same test for multiple high-stakes purposes, policymakers are at odds with the professional standards of the testing and measurement community” (McDonnell, 2005, 45). A moratorium and task force would provide the opportunity to clarify and support assessments for teaching and learning purposes while also identifying assessments for system evaluation that are appropriate for that purpose. An examination of the value of a randomized assessment for system evaluation purposes should be examined by the task force, with recommendations on appropriateness. The existing provincial programs need to be analyzed in relationship to their educational value. Is the FSA being used in conflicting and competing ways that undermine any value it might have? Are the Grade 10, 11, and 12 exams having an impact on curricular flexibility and deep learning? However, looking at provincial tests is only a part of the task. Local standardized exams are being used, often without a substantial assessment of their value and appropriateness. The task force should assess these assessments and develop recommendations on quality and appropriateness. The success of Finland on international, randomized assessments rests in a system that depends not on standardized testing, but on a highly educated and supported community of teachers. In contrast, a number of education systems that have been test-driven are much less successful. Protests against the heavy testing regimes are arising in many countries, including in Britain and the United States. In Canada, the Alberta legislature passed a motion calling on government to stop the census testing of Grade 3 students on an equivalent to the BC FSA. The Ontario Teachers’ Federation has also called for random assessments and using more than a single test result to evaluate schools. Ultimately, the main gift a teacher and a school can give to students is the joy of learning that will carry them throughout their life. Standardized testing produces a negative influence on this. Standardized tests narrow the curriculum as teachers teach to the test, with implicit and explicit demands that students be prepared for the test rather than supported in exploring the world, whether a topic will be on a test or not. likely have included on the standardized exam. For the marginal student, the focus on preparing for the test becomes another blow to their attempts to get an education. Rather than building on their strengths and interests, the testdriven classroom focuses on someone else’s choices. moving into a “post-standardization” world. most importantly, create more opportunities to motivate students toward deep learning. Improvement. Chicago: National Society for the Study of Education. News reports out of British Columbia show how the B.C. teachers are organizing with a strategic perspective. According to the Vancouver Sun (see below), B.C. teachers' agitation to encourage students and their families to opt out of the tests has resulted in one-third of the students in Vancouver no longer participating in the testing program. The same thing would happen in Chicago were the Chicago Teachers Union to follow the Canadian example. Parents in Chicago are waiting to have their children freed from the tyranny of the tests. The following article was distributed by Canwest News Service based on reports in the Vancouver Sun. While Al Ramirez videotaped Jiinny Sims, the audience in June 2008 listened intently as she described the organizing it took for the BC Teachers Federation to successfully do a province-wide strike in October 2005 and continue organizing against attacks on public education in Canada since. Substance photo by George N. Schmidt.A campaign against standardized tests in B.C. public schools is expected to intensify in January as a result of a deal between the B.C. Teachers' Federation and school employers that allows teachers to send three union pamphlets home with students and hand them to parents on school grounds. The agreement marks a surprising compromise between two parties that have been feuding for years over what union materials teachers are allowed to distribute. That battle heats up around this time of the year in the lead-up to the annual Foundation Skills Assessment (FSA), which tests Grade 4 and 7 students in reading, writing and math. Those tests are scheduled for Jan. 18 to Feb. 26. "Common sense prevailed," BCTF vice-president Susan Lambert said of the deal with the B.C. Public School Employers' Association. The deal lasts for one year and effectively ends eight union grievances against districts that had tried recently to stop teachers from disseminating BCTF materials because of alleged inaccuracies. "I think the process of going to fruitless arbitration and losing . . . over and over again was too costly for them," she added. The employers' association, which represents boards of education in labour matters, described the agreement as a practical solution to eliminate conflict in districts and end the grievances. "It's an attempt to formalize what the rules are," said chief executive officer Hugh Finlayson, noting there have been many years of litigation over the issue. Approved for distribution are pamphlets titled What Parents Need to Know, What Parents Need to Know: Foundation Skills Assessment (FSA) and Testing? You Bet. Teachers will now decide if they want to distribute them or send them home with students in the required sealed envelopes. The pamphlets argue that standardized tests force teachers to narrow instruction and "teach to the test," cause anxiety for students and do little to improve achievement. But the main reason the union objects to the FSA is because the results are used by the Fraser Institute every year to rank elementary schools. The Education Ministry insists the tests are not optional. But the BCTF campaign has drawn down participation rates in recent years–especially in Vancouver, where one in three students did not write the FSA last year. The BCTF plans to extend its anti-FSA message in early 2010 with newspaper and radio advertisements in Punjabi, Cantonese and Mandarin for the first time in order to reach ethnic groups that are believed to be more supportive of standardized tests. Arbitrators have ruled that teachers have a right to engage in political discussions with parents on educational issues. Lambert said they also have a responsibility to inform parents of their professional concerns about testing. It's just wonderful to read this. And why not in Chicago? And how dare our current union leadership in Chicago propose more of this b.s. merit pay. This is something CORE and any self-respecting group of public school teachers should use as a model to force the debate back to common sense vs. the business model that is destroying our world. Thanks Substance for reporting this! I agree 100%. Teachers in Chicago need to have the same courage as Canadian teachers and refuse to give the tests. Our children need to be given back the joy of learning without all the pressure. Our Union has sold us out along with the students by agreeing to more testing for merit pay. Someone needs to put a stop to it!!!!!!!!!!!!! !